Once he completes the Cheniere training, which he said pays $23.50 per hour plus a $60 per diem, Sasin plans to complete his associate’s degree in welding at Del Mar College. He then hopes to be hired by Cheniere at their multibillion dollar liquefied natural gas facility in the nearby city of Portland, he said. Around the corner from Ingleside High School’s welding bays are the industrial instrumentation classroom and lab where students like John Nichols are learning the fine points of electrical circuitry, pressure, level, and flow. “After high school, I’m going to continue at Del Mar, get my certificate, and get a job at a plant as an operator,” said Nichols, 17, a senior who takes a bus to the class from neighboring Gregory-Portland High School. Nichols and his classmates know that, with the right certifications and two-year technical degrees, chances are good they’ll be hired by the refineries, petrochemical plants, and other industrial facilities in the area, where starting salaries may range from $60,000 to $70,000 per year. This is San Patricio County, home to just over 66,000 people and measuring 693 square miles on the Texas Gulf Coast. Due to its location near the Port of Corpus Christi—the fifth largest port in the country in total tonnage—the county is also home to a seemingly endless number of industries looking to hire from the local workforce. Del Mar College, just over the Harbor Bridge in Nueces County, has for several years worked proactively with area industries and the independent school districts (ISDs) in San Patricio County to establish workforce and technical training programs in the high schools, such as welding, industrial instrumentation, and process technology. But the pipeline of companies coming into the county and a booming economy necessitated a more formal organization between the seven ISDs and the college. On June 1, they all joined in Portland for the first meeting of the San Patricio County Workforce Development Consortium. Created under interlocal agreement, the consortium provides an organized structure that will help the ISDs work more closely together to develop career and technical programs that precisely meet industry needs. As the fiscal manager of the consortium, Del Mar will work with the ISDs to seek funding through grants, donations from industry partners, and other sources to make the programs possible. “We work with business and industry to know what the workforce needs are in the community,” said Lenora Keas, Vice President of Workforce Development and Strategic Initiatives at Del Mar College. “It’s fulfilling our mission to provide workforce training." CNAs are in demand in hospitals, long-term nursing facilities, and mental health settings, where they care for patients and residents. Employment in the field is predicted to grow more than 30 percent, according to the TWC. Del Mar’s CNA program is also a first step toward a career as a registered nurse. Besides career training, school districts want their students to have local career options. “We want to meet the industries’ needs in our area and give our kids training so they’ll stay here,” said Troy Mircovich, Ingleside ISD Superintendent. While Ingleside ISD fills the need for industrial instrumentation training in the county, Gregory-Portland ISD’s niche is process technology. Both programs offer skills that are sought after in the refining, petrochemical, and manufacturing industries. 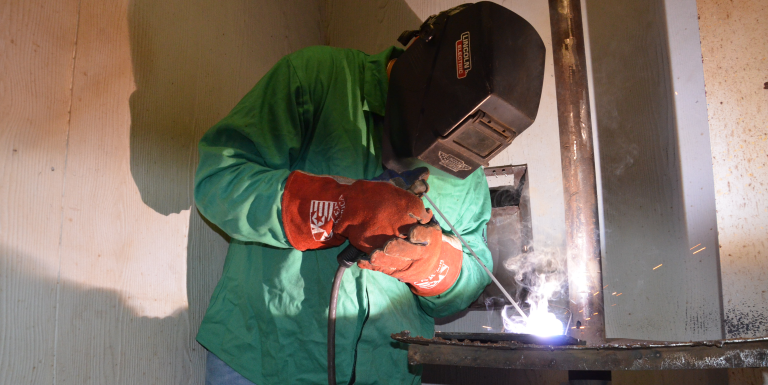 Enrollment in welding courses is strong enough that both high schools can offer the program, administrators said. ExxonMobil/SABIC, soon to be the county’s newest industrial resident, recently solidified plans to build what ultimately will be the world’s largest ethylene production plant on a 1,300-acre parcel. “We’re committed to hiring locally because local people tend to stay,” said John Mabry, manager with Gulf Coast Growth Venture Project, a joint venture of ExxonMobil/SABIC.